Carve a pumpkin: Don’t feel like dealing with pumpkin guts everywhere? Got it. How about painting one instead? It looks pretty and there’s way less clean up involved. Do fun fall activities: Apple picking, baking of pumpkin-flavored goodies, sipping pumpkin-flavored lattes outside as you do some leaf peeping. All fun and festive. Watch classic Halloween movies: You know that Hocus Pocus is playing on at least three channels right this very moment. Go watch. Have a costume party: Costumes aren’t just for kids! Invite your friends over and encourage everyone to dress up. See how creative everyone can get. That means none of this “sheet over the head and I’m a ghost” business. Hit up a haunted house: Pretend you’re not scared. We won’t tell anyone it was you shrieking like a little kid when the chainsaw guy popped out from behind the wall. 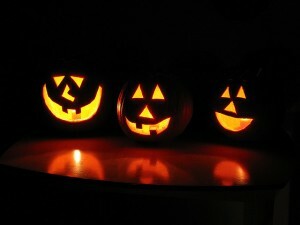 What are your must-do Halloween activities? Let us know in the comments!